For 80 years begins the story of a company that was born to shine. A special brand, with the main objective of uniting beauty and accessibility, without giving up quality. Bringing colors, well-being and what's best in bed, table and bath for the home of all Brazilians. With tradition and living history that reinvents itself with every collection, every environment that is renewed, every smile of satisfaction. 09/04/2019, 20:51 New banners in Artex - Cama, Mesa e Banho! 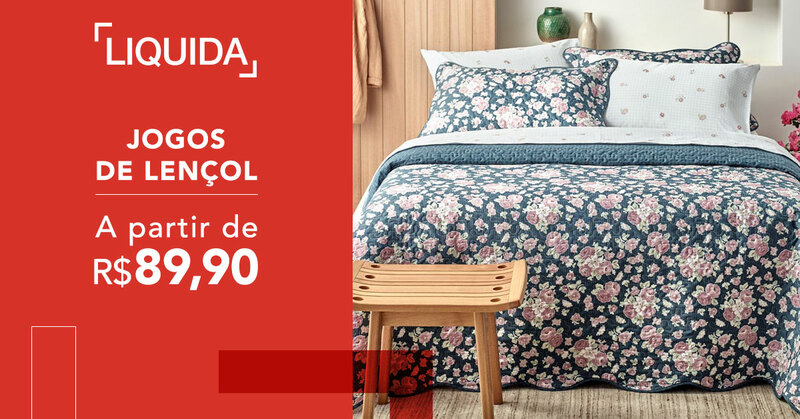 08/04/2019, 20:32 New deals in Artex - Cama, Mesa e Banho! Edredom Matelado Total Mix Jr Diego - Solteiro - Por 159,90. 05/04/2019, 16:56 New promotion in Artex - Cama, Mesa e Banho! Mantas a partir de R$ 79,90. 03/04/2019, 22:09 New deal in Artex - Cama, Mesa e Banho! 28/03/2019, 16:51 Commission increase in Artex! 15/03/2019, 17:21 New promotions and banner in Artex! New promotions and banner in Artex! 15/03/2019, 17:17 Consumer's Day - New promotion and banners in Artex! Consumer's Day - New promotion and banners in Artex! Consumer's Day - Free Shipping for the whole Brazil! 12/03/2019, 19:57 Consumer Day - New promotions and banners in Artex - Cama, Mesa e Banho! Comemore o Dia do Consumidor com a gente - Frete Grátis em todo o site. 21/02/2019, 21:59 New banners in Artex - Cama, mesa e banho! 07/02/2019, 21:53 Commission increase in Artex! Artex's commission increased to 6% per confirmed purchase. 05/02/2019, 21:18 New promotion and banners in Artex - Cama, mesa e banho! Jogo de lençol a partir de R$ 89,90. 05/02/2019, 16:23 New offer in Artex - Cama, mesa e banho! Artex takes colors, well-being and the best in bed, table and bath for the home of all Brazilians. With tradition and living history that reinvents itself with every collection, every environment that is renewed, every smile of satisfaction.